The 2018 NACHC Policy and Issues Forum has been a whirlwind of events and there’s just one more day before events draw to a close. Today’s highlight was an appearance by Alex Azar, Health and Human Services Secretary, who addressed a packed and enthusiastic General Session gathering. “We see you not just as vital partners in our movement toward a health system that delivers quality, affordable care for all Americans—we see you as pioneers in this effort already,” Azar told the audience. He also focused on health centers’ groundbreaking efforts to treat patients with substance abuse disorders, including opioids, saying, “Health centers have rapidly adapted to the challenge of opioid addiction, becoming centers for connecting patients to treatment and wraparound recovery services. This administration has been a strong supporter of that work.” Even better, Secretary Azar underscored that the FY 2019 budget includes $400 million in new funding for health centers to offer substance use disorder treatment and an additional $150 million for rural and underserved areas. 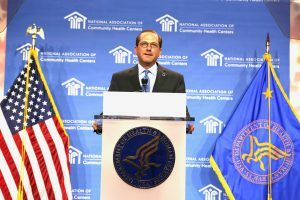 Azar’s standing ovation appearance was followed by George Sigounas, Administrator of the Health Resources and Services Administration (HRSA). Sigounas’ praised the work of health centers in many areas but singled out their pioneering use of telehealth in rural areas. More than half (57%) of health centers are either utilizing telehealth, or in the process of implementing a telehealth program. Aside from the speaking program, however, the NACHC Policy and Issues Forum is about gathering under one roof to plan for the future and indeed honor the achievements of the past year. Among those achievements is the grassroots advocacy muscle that helped bring about a solution for the funding cliff that plagued health centers for the past year. NACHC Advocacy staff took the time to honor those folks with two types of awards – the Grassroots Advocacy Hall of Fame and the Elizabeth K. Cooke MVP award. Tomorrow’s General Session will feature the Emerging Leader Awards. A panel of speakers will also provide closer look at the resilience and recovery of health centers in Puerto Rico following the double blow of Hurricanes Irma and Maria.